Driving through miles and miles of farmland with rows upon rows of corn and soybeans was a new experience. The view from afar had a stunning sculptured look. When we are traveling our road of transition from one familiar place to some place unknown, it is natural to feel lost, scared and uncomfortable. Change does not generally come easily to us creatures of habit! What we can wind up missing are the bright spots along the way. These are the times when a new view or experience sparks our inner being. We might enjoy that new something quite unexpectedly. If our eyes are down and not looking, we might miss it entirely. Had I been reading a book instead of looking out the car window, I might have missed that beautiful Minnesota landscape! August is a month of vegetable gardens bursting with produce ripening. 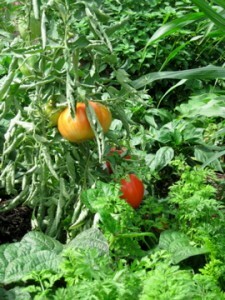 You may be watching your tomato plants in various stages of shades from green to orange and deep reds…their ripening happening right before our very eyes. We too, go through stages of ripening in moving from one place to another. In this month of bounty I encourage you to open your eyes! don’t look down. Look outward and around you. Where has your change and transition started to ripen? Maybe you have tried out one new behavior that fits wih where you want to go, not where you have been. Celebrate that movement! Perhaps you tried a new activity as a newly single person and really enjoyed yourself. Celebrate! You might have found yourself in new surroundings and felt that this was the beginning of a new home for yourself. Feel the accomplishment and Celebrate! Even the smallest of changes that spring within you are landmarks that show you are moving to where you want to be. Give yourself permission to enjoy the journey and definitely Celebrate!